What If Willys still made Jeeps? It's interesting how well pieces fit together, the inner fender curve (1991 part) matched the curve of the Willys outer fender (1954 part). I had to shorten the back of the front fenders and add a filler between the 91 grill frame and the '54 fenders. Same in the back the fenders were shortened and narrowed to 7" if you look close at the rears you will see the final at the front of the fenders is actually the front of the 91 Front fenders. All parts bolt on as original, the body tub, hood, and grill have no modifications (other than a few mounting holes drilled for the rears). All the new hybrid parts could be bolted on any YJ. I'm thinking it would be cool to (If enough interest was generated) find someone to make molds and reproduce them in fiberglass. As long as I got credit and consideration. The body is going to be painted "Fire-thorn Red Pearl" base coat clear coat with polished stainless hardware hinges etc. Until recent models Jeeps still retain their simplicity. And I've never had a Jeep leave me stranded. Larry's Comment: Thanks for the photos of your cool project Edward. 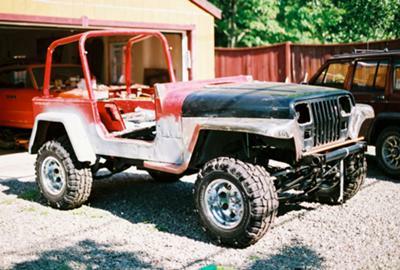 You and I e-mailed about this hybrid Willys and YJ combination and I look forward to more details as it progresses. Comments for What If Willys still made Jeeps? My Jeep is 'All Storm' 1992 [made in Israel as combination of Scrambler tub and Alaska post hard top on YJ] and I'm thinking to give it retro Willys wagon look by change the hood, grille and fender. Never see one like that [I wonder why] and your project is encouraging me. Do you have more pics / close-up pic?